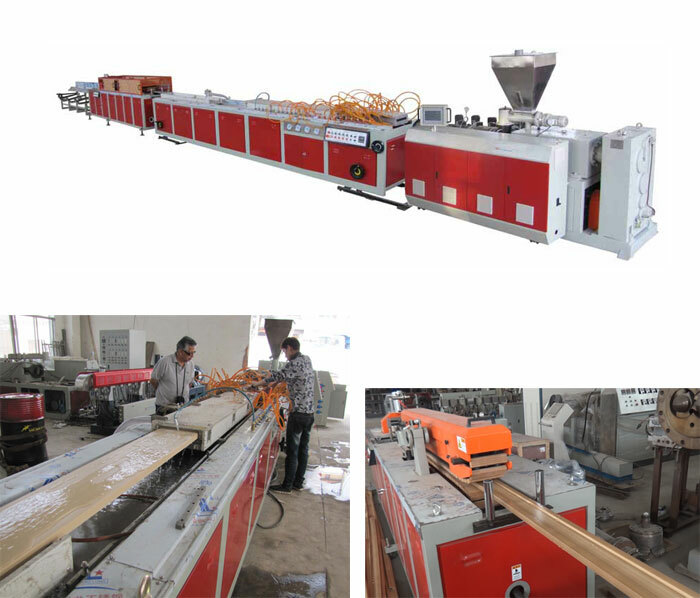 PVC wood profile one step extrusion production line | Silver Python Machinery Co., Ltd.
Wood-plastic one-step ,, which remove step of intermediate granulation , the raw materials directly in a group of equipment to complete the compounding, product extrusion molding. The advantages of this method are high efficiency, good mixing plastic, energy saving significantly, lower production costs. At present, it is mainly used in the extrusion molding of PVC products. However, this method has a high demand for raw material formula, feeding device, supporting mold and extrusion equipment, and the overall technical level of production staff High expectations. PVC wood plastic one-step extrusion equipment from the wood-plastic conical twin-screw extruder, vacuum stereotypes, traction cutting machine, unloading rack composition. The production line host, traction machine are used frequency control, temperature control instrument selection of imported quality products. Auxiliary vacuum pumps and traction motors are used high-quality products, easy maintenance. Replace the screw and mould die, can directly squeeze foam profile, the effect is better than the single screw. The production line can provide PLC control and conventional control options. One-step production process is the main feature of the production of wood-plastic products, a single color, products need surface treatment, products can not afford gravity. Suitable for production and floor supporting the baseboard, window frames, door sets, wall panels, furniture, wood and other wood products. The production line , adjusting the mold ,can also produce wood plastic (PVC) the overall door, wood-plastic wall panels, PVC hollow insulation tile and other sheet extrusion.